Blogging has been light this week and will be light next week, since I am in the midst of our annual Guys ski trip—this week in Park City and next week in Big Sky, Montana. I am still following things, nevertheless, and was somewhat amused to see today be one of those "good news is bad news" days. February jobs growth was stronger than expected, confirming that labor market conditions have improved. But not by much. The economic outlook has not improved dramatically, it's simply gotten a bit better. Whether the Fed tightens one month earlier than expected as a result of this number is almost a trivial matter. Short-term rates are not going to be problematic for the economy for a long time, no matter what. I see no reason the economy couldn't continue to (very slowly) improve even as the Fed raises short-term rates a couple of hundred basis points over the next two years or so (that's a forecast drawn directly from the bond market's current expectations). The chart above documents the improvement in the labor market over the past year. The 6-mo. 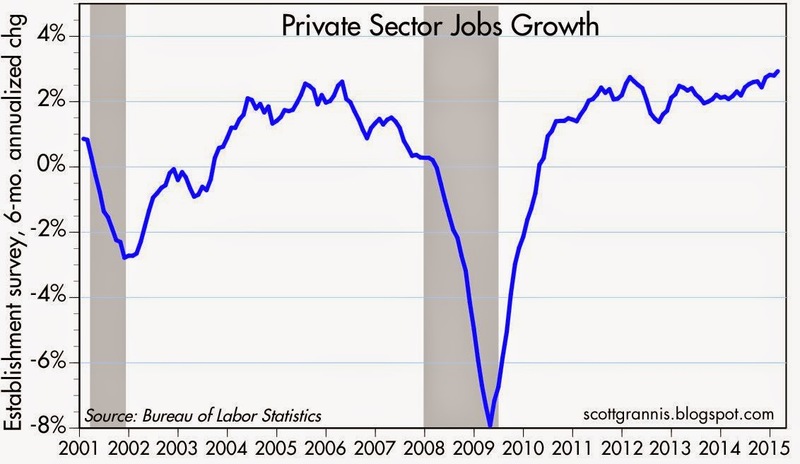 annualized growth rate of private sector jobs (the ones that really count) has inched up from 2.1% early last year to 2.9% as of last month. That's hardly enough of an improvement to transform the economy within the foreseeable future, since the number of jobs is still roughly 10 million less today than it could be if this had been a normal recovery. Even with 4% jobs growth it would take many years for the economy to get back to a level at which the Fed might begin to worry about the economy "overheating." For things to get dramatically better we'd need to see some big changes coming out of Washington: reduced tax and regulatory burdens, to name just a few. Sadly, that doesn't seem to be right around the corner. Arguably, the more important developments in the economy are being overshadowed by the modest improvement in the jobs market: monetary developments. 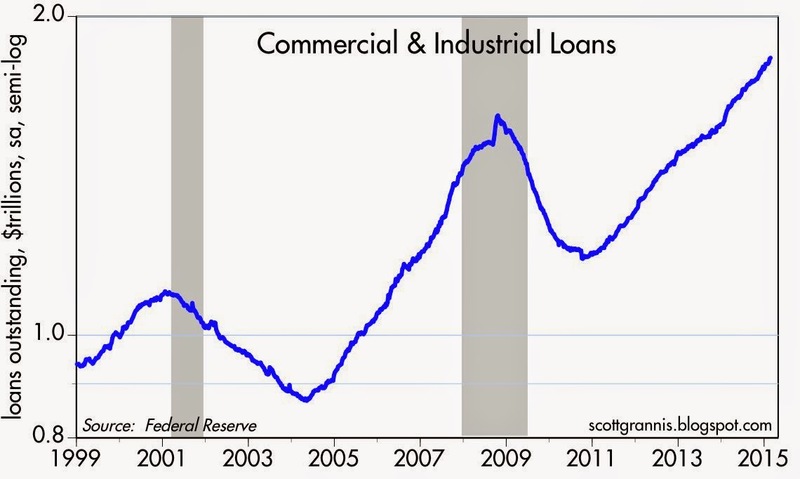 Banks are lending, and at a fairly rapid pace. C&I Loans, as shown in the chart above, are growing at a 12% annual pace. This is an important indicator of rising confidence: banks are more willing to lend, and businesses are more willing to borrow. Banks have huge supply of "excess" bank reserves on hand, enough to support a terrifying increase in lending and money supply growth if they chose to do so. Hiking short-term interest rate by a few notches is not going to change that equation. The relatively fast growth of lending is a sign of rising confidence and a sign of declining demand for money. When you want to borrow more, you want less exposure to money; you want to be short money. When you want to borrow less, you want more exposure to money, etc. The whole point of the Fed hiking the interest rate it pays on reserves is to keep the banks from increasing lending too much; to keep them satisfied with holding bank reserves, which are effectively T-bill substitutes and the quintessential "money" asset—risk-free, default-free, and with a floating interest rate. The thing to worry about today is not whether the labor market is growing a bit faster, but whether the Fed is failing to raise rates by enough to keep the growth of bank lending within acceptable limits. Too much lending would result in a large increase in the money supply and it could eventually debase the dollar, resulting in rising inflation (too many dollars chasing too few goods and services). As the chart above shows, the growth of the M2 measure of money supply has averaged about 6.5% per year over the past 8 years. Since 1995, M2 has grown about 6.2% per year, so it would appear that nothing unusual is going on. But over the past several months, the 3-mo. 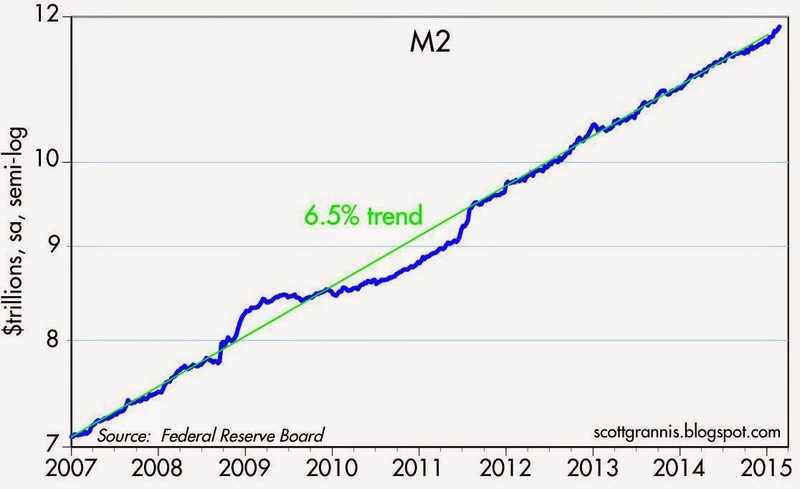 annualized growth of M2 has climbed to 10%. Money supply growth is really picking up, most likely because of the increase in bank lending. Total bank credit is up 8.3% in the past year, which is the fastest pace of growth since prior to the Great Recession. So far, there are no alarm bells ringing. Despite the more-rapid pace of bank lending and the more-rapid pace of M2 growth, the dollar is doing very well. 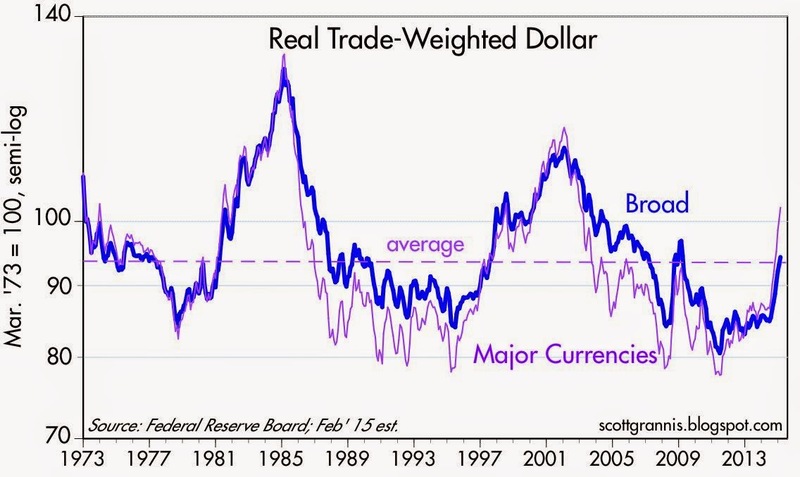 Demand for dollars is outpacing the supply of dollars, so the Fed is not yet "behind the curve." Add it all up: the labor market is gradually improving, confidence is gradually building, and the Fed has managed to keep the supply and demand for money in balance. What's not to like? I never know what to make out of the assumption that private sector borrowers and lenders will lose perspective if interest rates are too low. Can bank lending to viable borrowers lead to inflation? I still think the problem is the 10 million people without jobs. And, yes taxes are too high, many regulations are stupid. "Demand for dollars is outpacing the supply of dollars." Yes! And this is why the Fed shouldn't raise rates now. Unless you think velocity will move significantly to the upside - and I would argue there isn't a good reason to think this - then I don't see the case for raising rates. In addition, the Fed now has the underappreciated ability to merely raise the rate paid on excess reserves to put the kybosh on lending. Lastly, the price action in gold also supports the contention that rates don't need to be raised. You mentioned the huge excess of bank reserves. I've read that it is to the tune of $2T. Have not seen that any place official looking. Also, not clear if that is world wide or just the US. If that is just the US, then to put it in perspective that would be about $6150 per person (325M US population). Or $16,800 per full time employee (119M full time employed). There are excess reserves of about $2.5 trillion. Yes, that is about $7,860 in excess reserves for every man, woman and Child in the United States. It sounds nutty, but the Fed about about $12,788 worth of bonds for every U.S. resident. Another crazy figure: There is about $1.34 in cash, outside of US banks, in circulation, or about $4,000 for every US resident. These are some big numbers. Re: reserves. The important thing to keep in mind is that the Fed for the most part did only one thing: it bought notes and bonds and it issued bank reserves, which are functionally equivalent to T-bills. It effectively turned some $4 trillion of notes and bonds into $4 trillion of T-bills. It was all done to satisfy the banking industry's demand for safe, interest-bearing assets. The weather and snow conditions in Park City is perfect for spring skiing. Bring plenty of sun block and you will have a great time. The $1.5 trillion "gap" between total note and bond purchases and excess reserves you refer to is mainly accounted for by currency in circulation (just over $1.3 trillion currently). For every dollar of currency the Fed emits, it must receive and hold one dollar of reserves. Banks get currency from the Fed on demand, by tendering bank reserves.